In One Punch Wonder, director and writer Amanda Crewes takes a fiercely honest and raw look at the impact of male violence and how masculinity is becoming synonymous with aggression and intimidation. 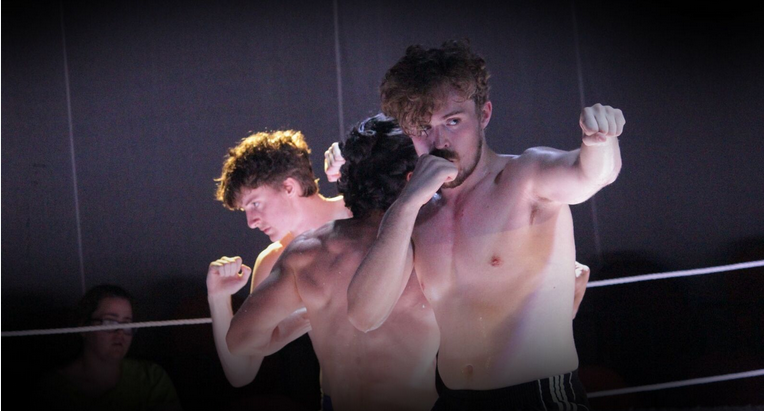 The performance takes place in a boxing ring; it is the symbol of male dominance with the physical contact and the hostility that takes place inside. We are seated around the perimeter of the ring, like a cheering audience waiting for the punches and bloodshed. Except we never shout, we sit there, stunned by the performances and the material that is presented to us. Crewes puts her cast of four - Adam William, Christian Tomaszewski, Andrew Dunstan and Levi Widnall - through the ringer with her challenging direction and choreography. They are constantly on the go and bring are the picture perfect image of the mentality that boys will be boys who are simply having a laugh and mucking around. But here, their idea of fun involves throwing punches at each other and proving who is the dominant one. One of the most unsettling moments in One Punch Wonder doesn't actually involve violence between the men but the passing around of an invisible woman - perhaps drunk and unconscious - and having a variety of sexual acts performed on her. Violence between men is not the issue, violence in all its forms by men is the problem. Initially Crewes' direction is intentionally erratic and fast moving. It's impatient and threatening, but as the show continues, there's a gentler approach that she undertakes. The movement is still there but it's slightly calmer and considered, which makes the images created from the first half even more affecting. The performances by the four men are incredibly intense. The physicality they take and the rage they release in the ring while wearing their boxing shorts, is captivating and frightening. Not from seeing this violence being depicted on stage but because of the undeniable fact that we all know it is happening. It happens all the time on our streets. Living in the city, I get woken up by it happening right outside my building at 3am. Crewes doesn't hold back in her exploration of toxic masculinity and because of this, it is an engrossing piece of brutal theatre. There are a few times when it risks turning into a lecture with facts and figures being called out by the cast, but it still has you walking out and talking about the problem and how we can create a change to these attitudes. One Punch Wonder puts male behaviour under the spotlight and – especially as a male - forces you to question if this is the kind of person you want to be see in your friends, family and yourself. It really is a shame this season was only on for three nights because it should be required viewing by men of all ages. One Punch Wonder was performed at Theatre Works between 25 - 27 September 2018.